“In America, you can say anything you want as long as you don’t DO it. In Thailand, you can do anything you want, but don’t SAY it!” This was one of the lines in a talk last Sunday by Dr. Sunyarat (Ton) Ratjatawan, PhD, a Bangkok psychologist. Dr. 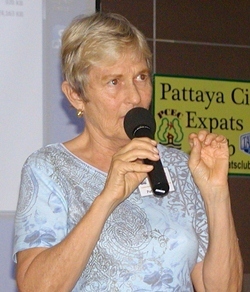 Ton during his presentation to the Pattaya City Expats Club on Sunday, May 26, was explaining some of the cultural differences between America and Thailand as he talked about the psychological and multi-cultural issues related to life in Thailand. Although he was born in Thailand, he spent 37 years in the U.S. where he received his education; BA in Psychology from Loma Linda University, MA in Psychology from Loyola Marymount University, and PHD in Psychology from the University of Southern California. He came back to Thailand in 2005 to help people affected by the tsunami, where he spent four years in the southern provinces developing counselling facilities, multiple orphanages and community based programmes for the survivors of the tsunami. He then decided to stay; moving to Bangkok where he teaches at two universities and conducts counselling programs. “In America, you can say anything you want, as long as you don’t DO it. 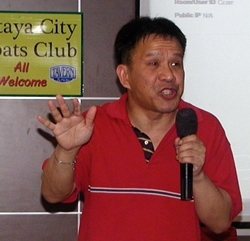 In Thailand, you can do anything you want, but don’t SAY it!” Thai born, US raised Dr Sunyarat (Ton) Ratjatawan, PhD, Bangkok psychologist introduced his talk to Pattaya City Expats Club on the 26th of May with these insightful words. He mentioned there are many reasons why foreigners might want to live in Thailand. For some, the reason is the freedoms that Thailand offers compared to some other countries. Dr. Ton relayed the stories of some foreign students at graduation. One was a Saudi Arabian woman who was crying after receiving her degree. These were not happy tears as she was crying because she had to go back home and wouldn’t be allowed to drive a car. Another was a Russian student who didn’t want to go back home because he said he couldn’t be openly gay in Russia. Aside from the freedoms that Thailand offers, other reasons for wanting to live in Thailand include lower cost of living; the easy lifestyle; and Thai culture. In addition, Dr. Ton said people may be tired of the government or the society back home or they may be fleeing someone or something (e.g., alimony or child support). He said that in Thailand he works mainly with non-Thais, many of them Indians who were born in Thailand. He explained that it is hard to practice his profession with Thai people because they don’t have a tradition of seeing psychologists as they can see a monk or talk to people in their family. As a result, he has to explain to Thais how he can help them. In addition, Dr. Ton said that establishing a rapport with a Thai client is not easy. One reason is that one of the most important things for Thai people is saving face. Another is they are not open about their feelings; they keep things bottled up. Chairman Pat Koester advises members of the Annual General Meeting on the 7th of July, and the procedure for elections for the Board of Governors that day. Dr. Ton said that another cultural difference is that Thais are more materialistic; they like to show off new clothes or other possessions. In some villages, people measure wealth by the size of the house (“Oh, she must have a farang boyfriend!”) or the number of university degrees the son has earned. He also said that Thais see expats as rich and able to travel as well as seeing the West as a land of opportunity. When he returned to Thailand after the tsunami, Dr. Ton worked a lot with people who had post-traumatic stress disorder (PTSD). “You don’t get over PTSD,” he said, “but you can adjust to it.” He told the story of a 90-year old lady in Japan. She survived the atomic bomb in Nagasaki, but even today, whenever she hears a plane overhead, she looks up and wonders if that is really an airliner or might it be a B-29 bomber? Anything can trigger PTSD episode even if the traumatic experience was long ago. Dr. Ton said that he was glad to be back in Thailand even though he experienced “reverse culture shock.” Life in Thailand is less stressful, he said, although it can sometimes be a lot more frustrating. In answering questions he was asked what an Expat should do to get along with their Thai daughter-in-law. “When in Rome, do as the Romans do,” Ton responded. In other words: Try to understand her issues and how she sees things. 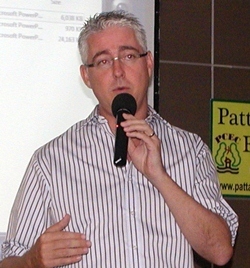 General Manager of the Amari, Australian Brendan Daly announces the renewal of the agreement between PCEC and the Amari for meetings held in the Tavern by the Sea each Sunday morning. He was also asked how well Thais adapt if they leave Thailand for the U.S. or another country. Some adapt, he replied, but most have trouble. It is much harder for Thais to adapt “over there” than it is for foreigners to adapt here, he said. Thais feel racism because being Asian, they are in the minority; they feel alone and lonely; and they long for Thai society. The primary reason he said is because Thailand is a collective society, whereas the U.S. is an individualistic society. In response to the question about why there are so many older foreigners with younger Thai partners, Dr. Ton responded that for many it is the need for companionship or love, and the desire to have a caregiver. In addition, he said, foreigners enjoy receiving compliments; they are usually treated as someone special here (as compared to back home).